Reading Wicked Game was definitely a highlight of my summer reading last year. It easily made my Best of 2008 list and I've been looking forward to the sequel ever since. 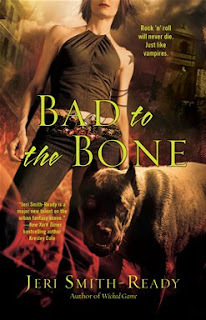 Fortunately, the ever awesome Jeri Smith-Ready took pity on me and hooked me up with an ARC of Bad to the Bone, which is due out May 19th. And let me tell you--you want to get a hold of this book. And if you haven't read Wicked Game yet, now's the perfect time to do so as the mass market edition was just released! That way you'll be primed and ready for this rockin' sequel. Ciara's life has changed just a little bit since she first came to WVMP as a part-time marketing intern. She is now, for all intents and purposes, the station owner. What that means is she is on the clock 24/7 taking care of her little flock of vampire DJs, spinning PR as the vamps spin the tunes that are their lifeblood. She's working towards her degree, taking night classes at the local community college. She is also in an increasingly serious relationship with Shane McCallister--the station's resident 90's grunge rock expert. When a group of anti-undead religious fanatics comes to town determined to stop the signal, dismantle the station, and destroy the vamps for good, Ciara and the gang refuse to go gently into that good night. This series is just so entertaining. I can honestly say I went in not knowing what to expect plotwise, and I finished it feeling like Ms. Smith-Ready took everything and everyone in exactly the direction they needed to go. I felt thoroughly satisfied and, more importantly, I cared about each of them more than before. Even Regina. Though Jim still scares the crap out of me and Shane should not let him anywhere near Ciara ever again no matter what kind of lousy shape he's in. I continue to be extremely fond of Ciara and so it was both heartbreaking and extremely gratifying to watch her deal with her manipulative, ne'er do well father, her growing feelings for Shane, a new undead pet, and finding herself suddenly homeless. And I do have to say that, within the larger UF world, it's nice to find one without a love triangle. I love reading about Ciara and Shane. They're flawed, messed up, in danger of going off the deep end in more ways than one. And despite all of this, they treat each other carefully. How often do you read about a human/vampire couple in which the vampire is the more vulnerable of the two? She takes care of him. She keeps him tethered to the here and now. It's freaking awesome. The good news? Pocket Books bought two more books in this series. The third one will be out sometime next year. In Bed With Books Interview with Shane! Can't wait to get to this one! I read the first chapter on her website, and I am most definitely ready for more. Chelle, it is SO good. I just love the world she's created with this series. I haven't even heard of this book, but I will definitely look for it now. Sounds TERRIFIC!